Throughout the world, most cultures revere fermented foods for their health and digestive benefits. Kefir, a tangy, yogurt-like beverage originating from Eastern Europe, is one of the most powerful and nutritious of these traditional cultured foods. We’ve been told for a long time that bacteria in all shapes and forms are bad. But we now know that having “healthy” bacteria in the body is very important for overall health. However, as we live in a culture where antibiotics are overprescribed, and antibacterial hand sanitizers, soaps and cleaners are used by just about everyone, many of us are lacking these healthy bacteria. That’s where probiotics come in. Probiotics help to restore or microbiome, or gut bacteria, and have been shown to help aid both mental and physical health in an incredible amount of ways. Kefir, as a fermented food, is one of the BEST sources of probiotics, as it contains many important strains — usually around 30 — of the “good” bacteria. 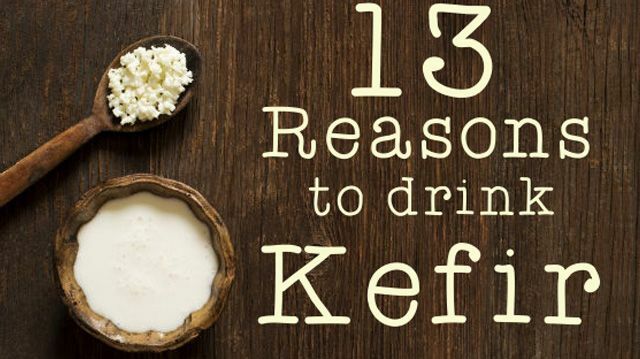 Probiotics aren’t the only healthy thing we get from kefir. A 6 oz serving of the beverage also contains 6 grams of protein, 20 percent of the daily recommended amount of calcium, as well as high amounts of phosphorous, vitamin B12, vitamin B2, and magnesium. Research is beginning to suggest that probiotics may play a role in inhibiting tumor growth and protecting against cancer. So far, they’ve been shown to reduce the number of cells related to colon cancer, breast cancer, and leukemia. Although the protective effect of probiotics against cancer is not yet fully understood, their benefits are thought to come from the fact that they can boost the immune system and may help to reduce the development of carcinogenic compounds. Osteoporosis, or the degeneration and weakening of bones, is a huge problem in Western countries. However, kefir may be an important superfood in helping to prevent this condition! As we mentioned earlier, kefir is high in calcium, thought to be the most important nutrient in supporting bone health and reducing the chances of osteoporosis. It also contains vitamin K2, which has been shown to be crucial to the body’s ability to absorb and use calcium. In fact, recent studies have suggested that drinking kefir can increase calcium absorption, which can lead to stronger bones! Allergies occur when your body has an inflammatory reaction to a foreign substance that really should be harmless, like dust, peanuts, or pollen. Although there is a genetic component to allergies, researchers also estimate that our increased usage of things like antibiotics and hand sanitizers has killed off beneficial bacteria that would normally protect us from such invaders, weakening our bodies’ natural resistance to certain substances. So to restore our bodies’ defenses, we need to replenish those good bacteria that we’ve been killing off for years, through — you guessed it — probiotics! Science is confirming this, as so far studies have suggested that probiotics can benefit asthma, eczema, seasonal allergies, and allergies to peanuts. Other studies where infants were given probiotics have suggested that those given probiotics early in life are less likely to develop allergies later. And as we mentioned before, drinking kefir is a great way to get your daily dose of probiotics! It seems like everyone wants to detox these days, but people have very little information about how to do it correctly and safely. Well here’s a scientifically backed way to do it: drink kefir! Kefir helps the detoxification process by binding to some mutagens, agents that can literally change your DNA, by not allowing them to do so. One example of a mutagen is aflatoxin, a toxic mold found in peanuts and peanut butter, some vegetable oils (canola and soybean) and some grains (wheat, soy, and corn). The lactic acid in kefir actually enables it to kill aflatoxins and other molds and fungi. Kefir’s ability to aid digestion is also a huge help when you’re trying to detox and get harmful substances out of your body. Just like antibiotics can wreak havoc on your digestive system, the probiotics in kefir are wonderful for healing and supporting digestion! Poor digestion is often caused by imbalanced microflora in the gut, and as we mentioned earlier, kefir works by re-populating the digestive tract with strains of bacteria that are beneficial for the gut! Furthermore, studies have shown that probiotics can help with diarrhea, by shortening episodes and reducing antibiotic-associated diarrhea, as well as help with constipation. Other studies suggest that probiotics can help with IBS, Crohn’s disease, and pouchitis. We here at the Alternative Daily recommend you get your nutrients from healthy whole foods, rather than pills and supplements, as much as possible! And getting probiotics in your diet is really no different. Although probiotic pills are not harmful or taxing on the body when used properly, like some supplements can be, many brands do contain synthetic fillers! Furthermore, probiotic pills don’t contain the additional nutrients that kefir contains, such as protein, calcium, and vitamin B. If you’re thinking you don’t need to drink kefir because you already eat yogurt — think again! Although yogurt is probably the most popular form of probiotic food in the West, kefir is actually a more powerful source of the healthy bacteria. In fact, kefir usually contains about 30 strains of bacteria, whereas yogurt products usually only contain about 10. We know now that antibiotics don’t only attack bad bacteria — they kill just about everything. Even the good stuff. Although it’s best to avoid antibiotics as much as possible for this reason, sometimes a stubborn or dangerous infection can come along that requires them. When this happens, taking probiotics in some form is crucial to help your body begin to rebuild the healthy strains of bacteria that will most likely be destroyed by the antibiotics. Science supports this as well. Studies have shown that people who take probiotics at the same time as antibiotics are quicker to reestablish healthy bacteria in the gut, and are also less likely to experience antibiotic-related side effects like diarrhea. As we mentioned before, kefir contains over 30 strands of bacteria, and is therefore a great way to recolonize your gut! Although it may seem counterintuitive, you actually may want to drink milk kefir if you know you’re lactose intolerant, as studies have shown it can actually improve lactose tolerance and digestion! The reason is that kefir introduces bacteria that are effective lactose metabolizers to your gut. Kefir comes and can be made in so many varieties! There’s plain milk kefir, water kefir, as well as delicious and nutritious coconut water kefir, which is highly alkalizing. There are also many flavored varieties in the grocery store, but these should be avoided as most are high in sugar. Kefir can be consumed plain, with a few teaspoons of honey, or added to smoothies. Homemade kefir contains more beneficial bacteria strains than the store bought variety, and it’s also simple to make! 1. Pour the milk into the clean glass jar, and then stir in the kefir grains. 2. Cover the jar with the cheesecloth and then secure it with a rubberband. 3. Allow everything to sit at room temperature, away from sunlight, for 12 to 48 hours. 4. When it’s ready, strain the kefir into your storage container, catching the grains in the strainer. This kefir can either be drunk immediately or refrigerated for up to a week. 5. Transfer the used grains into fresh milk and start again! Note: As you’re waiting for your kefir to ferment, try to check it every few hours. When it starts to become thick and tangy, it’s ready! At normal room temperature (about 70°F), this will take about 24 hours, in warmer temperatures it may happen quicker. After 48 hours, if it still hasn’t fermented, you’ll want to try again with new grains. To make your own coconut kefir water, see our instructions here. Next articleJust One More Reason to Walk! Hey Buddy!, I found this information for you: "Ward off Cancer and 12 Other Reasons to Drink Kefir". 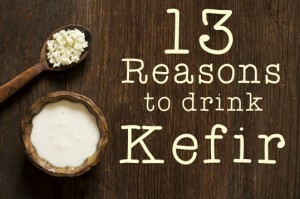 Here is the website link: https://www.thealternativedaily.com/kefir-benefits/. Thank you.